It’s time to use and review Apologia Exploring Creation with Human Anatomy and Physiology! This homeschool science curriculum is loved by many people. We’ve used other science books from Apologia in the past, but we didn’t have the complete curriculum – our first Apologia book came as part of a box curriculum set and I didn’t even realize that a notebook or other materials were available for it! 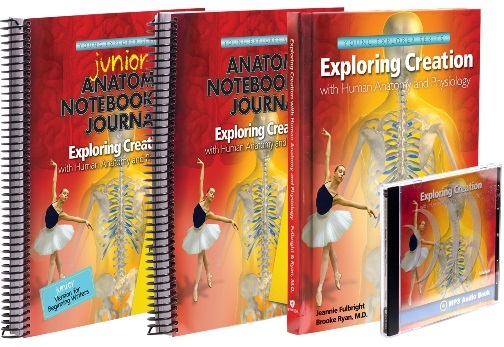 For this review, I received the Apologia textbook, Anatomy Notebooking Journal, Junior Anatomy Notebooking Journal, and the Audio CD. Because I have three children who are using this science curriculum, I bought a second Anatomy Notebooking Journal. You should have a journal for each child who is using the curriculum. The Apologia textbook is robust. The content is detailed and might be too much for some children, especially at the lower end of the age range (K-6th). It’s perfect for us! My kids are K, 2nd, and 5th this year and they are all benefitting from this curriculum. They beg me to do more science and more lessons and they’ve been excitedly telling people that they’re studying anatomy. You can see inside the textbook in my video review. The notebooks are Charlotte-Masonish to me, in that they are more open-ended and promote student thought and response. I’ve got three kids using this program, so I’ve got a lot of student sheets to show you! We tore out this Junior notebook page and taped it to the wall. This page is not in the regular notebook and all my kids wanted to revisit it multiple times. I go over the differences between the Junior Notebook and regular Notebook in my video review, but basically the Junior Notebook has coloring pages and some easier vocabulary work, and the regular Notebook has crossword puzzles and more difficult vocabulary work. The Junior Notebook has larger print for the copywork, too. See my kids sitting around following along in their notebooks and textbook as they listen to an audio CD? The Apologia audio CD is well done, with good quality. It reads most of what is in the textbook and my kids didn’t have trouble following along. I wish it would play in my regular CD player, but I guess nobody even uses those anymore, so this CD plays only in a computer. Most of our audio books play in a CD player, but some are like this one and need to be played on a computer, so I’m set up for it. If it worked regular CD player so we could have listened to it in the car for extra review, too. For books that we’ll use all year, I like to get an audio CD. This way we are more sure to stay on track with the lessons and reading. I stay with my kids and listen to the CD along with them – I don’t just leave them to do the CD on their own. They listen better with me in the room, modeling good listening skills. But, the CD gives my voice a break, and also lets me get up to tend to something without having to interrupt the lesson. My kids love the experiments. The experiments are involved, and require lots of guidance and materials. My kids have done many experiments, but not like these. In past years we did other experiments to go along with the Apologia book we were using, and they were not as good. My kids love the Apologia experiments more. They take up time, basically there is at least one experiment per lesson that could be a science fair experiment if you wanted, but they are great. I didn’t do experiments like this in public school except that one year that my school actually had a gifted program – we did a couple of experiments that still weren’t as detailed as these. Each Lesson has multiple experiments, but you don’t need to do all of them. So far, we’ve been doing all of them because I made it easier on myself this year. I confess. I bought a kit that came with all the materials I’d need for the experiments. They’re packaged up individually and you know what? I don’t regret it at all. My kids are getting a superior science education and they’re loving it. I’m really busy, and this was one more thing that made my life easier. Starting the experiment – we’re going to put apple slices into different substances and see what dries them out the most. Mid-experiment – apple slices packed away. The kids weighed each slice and noted the starting weight, and labeled the cups. Now, while my kids love science, they don’t love all science curriculum. They love Apologia, and they are really loving Exploring Creation with Human Anatomy and Physiology. I think that having the complete set with the notebooks, and doing experiments in the book, are the reasons why they are really enjoying this level so much.